2002-06-11 First worldwide family litigation filed litigation Critical https://patents.darts-ip.com/?family=9494376&utm_source=google_patent&utm_medium=platform_link&utm_campaign=public_patent_search&patent=US6277155(B1) "Global patent litigation dataset” by Darts-ip is licensed under a Creative Commons Attribution 4.0 International License. An oxidation dye composition for keratin fibers, and in particular for human keratin fibers such as the hair, comprising, in a medium which is suitable for dyeing, at least one oxidation dye precursor and optionally one or more couplers, characterized in that it also comprises a nonionic amphiphilic polymer containing at least one fatty chain and at least one hydrophilic unit, and the invention also relates to the processes and dyeing devices using the said oxidation dye composition. This application is a continuation of the U.S. national phase application Ser. No. 08/875,469, filed Mar. 6, 1998, (now U.S. Pat. No. 6,010,541 issued Jan. 4, 2000) based on International application No. PCT/FR97/01262 filed Jul. 10, 1997. The present invention relates to a composition for the oxidation dyeing of keratin fibres, and in particular of human keratin fibres such as the hair, comprising at least one oxidation dye precursor and optionally one or more couplers and at least one non ionic amphiphilic polymer containing at least one fatty chain and at least one hydrophilic unit. It is known to dye keratin fibres, and in particular human hair, with dye compositions containing oxidation dye precursors, which are generally known as “oxidation bases”, in particular ortho- or para-phenylenediamines, ortho- or para-aminophenols and heterocyclic bases. Oxidation dye precursors are compounds which are initially colourless or only slightly coloured and which develop their dyeing power on the hair in the presence of oxidizing agents, leading to the formation of coloured compounds. The formation of these coloured compounds results either from an oxidative condensation of the “oxidation bases” with themselves or from an oxidative condensation of the “oxidation bases” with colour-modifier compounds, or “couplers”, which are generally present in the dye compositions used in oxidation dyeing and are represented more particularly by meta-phenylenediamines, meta-aminophenols and meta-diphenols and certain heterocyclic compounds. The variety of molecules used, which consists, on the one hand, of “oxidation bases” and, on the other hand, of “couplers”, makes it possible to obtain a wide variety of colours. In order to localize the oxidation dye product on the hair when it is applied, in order for it not to run onto the face or outside the areas which it is proposed to dye, use has been made hitherto of traditional thickeners such as crosslinked polyacrylic acid, hydroxyethylcelluloses or waxes or alternatively mixtures of nonionic surfactants with an HLB (hydrophilic-lipophilic balance) which, when suitably selected, gives rise to the gelling effect when they are diluted with water and/or surfactants. However, the Applicant has observed that the ingredients of the traditional thickener, surfactant and solvent type generally curb the rise of the dye on the fibres, which is reflected in a dull shade and also in a larger use of dye, of solvent and/or of surfactants in order to dissolve the dye, if it is nevertheless desired to obtain and intense shade. Moreover, the Applicant has also observed that after mixing with the oxidant, dye compositions containing the oxidation dye precursor or precursors and optionally the coupler or couplers, and also the said ingredients, lose some of their gelled nature and consequently give rise to undesirable running. After considerable research conducted in this matter, the Applicant has now discovered that it is possible to obtain oxidation dye compositions (after mixing with the oxidants) which do not run and thus remain better localized at the point of application, and which also make it possible to obtain more intense or more chromatic (more luminous) shades, if an effective amount of a nonionic amphiphilic polymer containing at least one fatty chain and at least one hydrophilic unit is introduced (i) either into the composition containing the oxidation dye precursor or precursors and optionally the coupler or couplers (or composition (A)), or (ii) into the oxidizing compositions (or composition (B)), or (iii) into both compositions at once. For the purposes of the present invention, the chromaticity (luminosity) is defined by the value c* in the L*, a*, b* colorimetric notation system of the Commission Internationale de l'Eclairage (C.I.E.) This value is equal to the square root of the sum a2+b2 (+a is red, −a is green, +b is yellow, −b is blue). The shade is proportionately more luminous the greater the value of c*. In this notation system, L* defines the intensity of the shade. The shade is proportionately more intense the lower the value of L* (0=black, 100=white). (b) a copolymer of polyalkylene glycol ether of C16-C22 alcohol and of one or more esters of C16-C22 carboxylic acid. The invention also makes it possible to decrease the amount of active dyestuffs used in the dye compositions, when compared with the standard techniques known in the prior art. Another subject of the present invention relates to a ready-to-use composition for dyeing keratin fibres, which contains at least one oxidation dye precursor and optionally at least one coupler, and at least one nonionic amphiphilic polymer containing at least one fatty chain and at least one hydrophilic unit as defined above, and an oxidizing agent. The invention is also directed towards a process for dyeing keratin fibres, and in particular human keratin fibres such as the hair, which consists in applying to these fibres at least one composition (A1) containing, in a medium which is suitable for dyeing, at least one oxidation dye precursor and optionally at least one coupler, in combination with at least one nonionic amphiphilic polymer containing at least one fatty chain and at least one hydrophilic unit as defined above, the colour being developed at alkaline, neutral or acidic pH using an oxidizing agent which is mixed with the composition (A1) only at the time of use or which is present in a composition (B1) that is applied sequentially without intermediate rinsing. The invention is also directed towards a variant of this process, which consists in applying to the fibres at least one composition (A2) containing, in a medium which is suitable for dyeing, at least one oxidation dye precursor and optionally at least one coupler, in the presence or absence of nonionic amphiphilic polymer containing at least one fatty chain and at least one hydrophilic unit as defined above, the colour being developed at alkaline, neutral or acidic pH using an oxidizing composition (B2) which contains an oxidizing agent and an effective amount of at least one nonionic amphiphilic polymer containing at least one fatty chain and at least one hydrophilic unit as defined above, and which is mixed with the composition (A2) only at the time of use or which is applied sequentially without intermediate rinsing. The subject of the invention is also multi-compartment “kits” or devices for dyeing, a first compartment of which contains at least one oxidation dye precursor, optionally at least one coupler and at least one nonionic amphiphilic polymer containing at least one fatty chain and at least one hydrophilic unit as defined above, and a second compartment of which contains an oxidizing agent. According to another variant, the subject of the invention is also multi-compartment kits or devices for dyeing, a first compartment of which contains at least one oxidation dye precursor, optionally at least one coupler, in the presence or absence of nonionic amphiphilic polymer containing at least one fatty chain and at least one hydrophilic unit as defined above, and a second compartment of which contains an oxidizing agent and an effective amount of at least one nonionic amphiphilic polymer containing at least one fatty chain and at least one hydrophilic unit as defined above. The invention also relates to the use of the oxidation dyeing composition defined above or to the use of a multi-compartment kit or device for dyeing as defined above for dyeing human keratin fibres such as the hair. However, other characteristics, aspects, objects and advantages of the invention will become even more apparent on reading the description and the examples which follow. those modified with polyalkylene glycol alkylphenyl ether groups, such as the product Amercell Polymer HM-1500 (polyethylene glycol (15) nonylphenyl ether) sold by the company Amerchol. (2) hydroxypropyl guars modified with groups containing at least one fatty chain, such as the product Esaflor HM 22 (C22 alkyl chain) sold by the company Lamberti, and the products Miracare XC95-3 (C14 alkyl chain) and RE205-1 (C20 alkyl chain) sold by the company Rhône-Poulenc. (3) polyether urethanes containing at least one fatty chain such as C8-C30 alkyl or alkenyl groups, for instance the products Dapral T210 and Dapral T212, now known respectively as Elfacos T210 and Elfacos T212, sold by the company Akzo Nobel. The INCI names, as listed in the International Cosmetic Ingredient Dictionary and Handbook, for Elfacos T210 and Elfacos T212 are PPG-14 laureth-60 alkyl dicarbamate and PPG-14 palmeth-60 alkyl dicarbamate, respectively (International Cosmetic Ingredient Dictionary and Handbook, 7th Edition, Vol 2. pp. 1137 and 1140 (1997)). the products Antaron V220 or Ganex V220 (vinylpyrrolidone/eicosene copolymer) sold by the company ISP. (5) copolymers of C1-C6 alkyl methacrylates or acrylates and of amphiphilic monomers containing at least one fatty chain, such as, for example, the oxyethylenated methyl methacrylate/stearyl acrylate copolymer sold by the company Goldschmidt under the name Antil 208. (6) copolymers of hydrophilic methacrylates or acrylates and of hydrophobic monomers containing at least one fatty chain, such as, for example, the polyethylene glycol methacrylate/lauryl methacrylate copolymer. The nonionic amphiphilic polymers containing at least one fatty chain and at least one hydrophilic unit according to the invention are preferably used in an amount which may range approximately from 0.05 to 10% by weight relative to the total weight of the dye composition applied to the fibres. More preferably, this amount varies approximately from 0.2 to 5% by weight. R4 represents a hydrogen atom or a C1-C4 alkyl radical. Among the para-phenylenediamines of formula (I) above, mention may be made more particularly of para-phenylenediamine, para-toluylenediamine, 2-chloro-para-phenylenediamine, 2,3-dimethyl-para-phenylenediamine, 2,6-dimethyl-para-phenylenediamine, 2,6-diethyl-para-phenylenediamine, 2,5-dimethyl-para-phenylenediamine, N,N-dimethyl-para-phenylenediamine, N,N-diethyl-para-phenylenediamine, N,N-dipropyl-para-phenylenediamine, 4-amino-N,N-diethyl-3-methyl-aniline, N,N-bis(β-hydroxyethyl)-para-phenylenediamine, 4-amino-N,N-bis(β-hydroxyethyl)-3-methylaniline, 4-amino-3-chloro-N,N-bis(β-hydroxy-ethyl)aniline, 2-β-hydroxyethyl-para-phenylenediamine, 2-fluoro-para-phenylenediamine, 2-isopropyl-para-phenylenediamine, N-(β-hydroxypropyl)-para-phenylene-diamine, 2-hydroxymethyl-para-phenylenediamine, N,N-dimethyl-3-methyl-para-phenylenediamine, N-ethyl-N-(β-hydroxyethyl)-para-phenylenediamine, N-(β,γ-dihydroxy-propyl)-para-phenylenediamine, N-(4′-aminophenyl)-para-phenylenediamine, N-phenyl-para-phenylenediamine and 2-β-hydroxyethyloxy-para-phenylene-diamine, and the addition salts thereof with an acid. Among the para-phenylenediamines of formula (I) above, para-phenylenediamine, para-toluylene-diamine, 2-isopropyl-para-phenylenediamine, 2-β-hydroxyethyl-para-phenylenediamine, 2-β-hydroxyethyloxy-para-phenylenediamine, 2,6-dimethyl-para-phenylenediamine, 2,6-diethyl-para-phenylenediamine, 2,3-dimethyl-para-phenylenediamine, N,N-bis(β-hydroxyethyl)-para-phenylenediamine and 2-chloro-para-phenylenediamine, and the addition salts thereof with an acid are most particularly preferred. in which n is an integer between 0 and 8 inclusive and m is an integer between 0 and 4 inclusive. 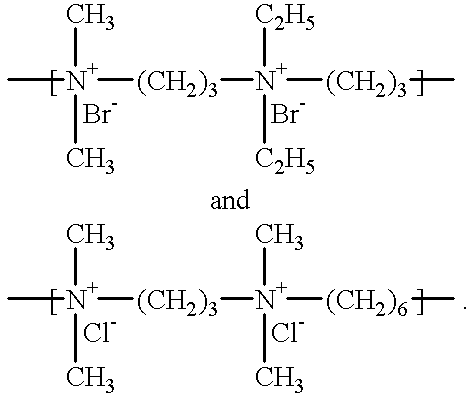 Among the bis(phenyl)alkylenediamines of formula (II) above, mention may be made more particularly of N,N′-bis(β-hydroxyethyl)-N,N′-bis(4′-aminophenyl)-1,3-diamino-2-propanol, N,N′-bis(β-hydroxyethyl)-N,N′-bis-(4′-aminophenyl)ethylene-diamine, N,N′-bis(4-aminophenyl)tetramethylenediamine, N,N′-bis(β-hydroxyethyl)-N,N′-bis(4-aminophenyl)tetra-methylenediamine, N,N′-bis(4-methylaminophenyl)tetramethylenediamine and N,N′-bis(ethyl)-N,N′-bis(4′-amino-3′-methylphenyl)ethylenediamine, and the addition salts thereof with an acid. 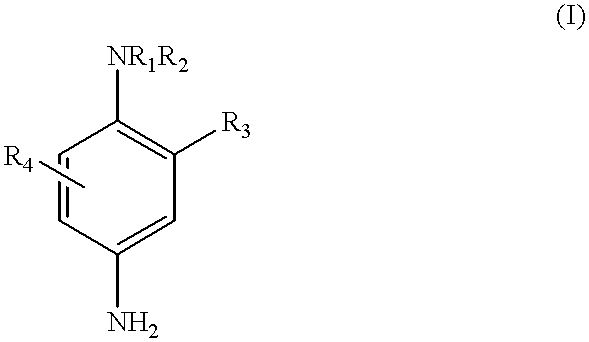 Among these bis(phenyl)alkylenediamines of formula (II), N,N′-bis(β-hydroxyethyl)-N,N′-bis(4′-aminophenyl)-1,3-diamino-2-propanol or one of the addition salts thereof with an acid is particularly preferred. R10 represents a hydrogen or fluorine atom or a C1-C4 alkyl, C1-C4 monohydroxyalkyl, C2-C4 poly-hydroxy-alkyl, C1-C4 aminoalkyl, C1-C4 cyanoalkyl or (C1-C4) alkoxy (C1-C4) alkyl radical, it being understood that at least one of the radicals R9 or R10 represents a hydrogen atom. Among the para-aminophenols of formula (III) above, mention may be made more particularly of para-aminophenol, 4-amino-3-methylphenol, 4-amino-3-fluorophenol, 4-amino-3-hydroxymethylphenol, 4-amino-2-methylphenol, 4-amino-2-hydroxymethylphenol, 4-amino-2-methoxymethylphenol, 4-amino-2-aminomethylphenol and 4-amino-2-(β-hydroxyethylaminomethyl)phenol, and the addition salts thereof with an acid. the ortho-aminophenols which may be used as oxidation bases in the context of the present invention are chosen in particular from 2-aminophenol, 2-amino-1-hydroxy-5-methylbenzene, 2-amino-1-hydroxy-6-methylbenzene and 5-acetamido-2-aminophenol, and the addition salts thereof with an acid. the heterocyclic bases which may be used as oxidation bases in the context of the present invention are chosen in particular from pyridine derivatives, pyrimidine derivatives and pyrazole derivatives, and the addition salts thereof with an acid. Among the pyridine derivatives, mention may be made more particularly of the compounds described, for example, in patents GB-1,026,978 and GB-1,153,196, such as 2,5-diaminopyridine, and the addition salts thereof with an acid. Among the pyrimidine derivatives, mention may be made more particularly of the compounds described, for example, in German patent DE-2,359,399 or Japanese patents JP-88-169,571 and JP-91-333,495, such as 2,4,5,6-tetraaminopyrimidine and 4-hydroxy-2,5,6-tri-aminopyrimidine, and the addition salts thereof with an acid. Among the pyrazole derivatives, mention may be made more particularly of compounds described in patents DE-3,843,892 and DE-4,133,957 and patent applications WO-94/08969 and WO-94/08970, such as 4,5-diamino-1-methylpyrazole, 3,4-diaminopyrazole and 4,5-diamino-1-(4′-chlorobenzyl)pyrazole, and the addition salts thereof with an acid. The couplers which may be used in the dyeing process according to the invention are those conventionally used in oxidation dye compositions, that is to say meta-phenylenediamines, meta-aminophenols and meta-diphenols, mono- or polyhydroxynaphthalene derivatives, sesamol and derivatives thereof and heterocyclic compounds such as, for example, indole couplers, indoline couplers and pyridine couplers, and the addition salts thereof with an acid. These couplers may be chosen in particular from 2-methyl-5-aminophenol, 5-N-(β-hydroxyethyl)amino-2-methylphenol, 3-aminophenol, 1,3-dihydroxybenzene, 1,3-dihydroxy-2-methylbenzene, 4-chloro-1,3-dihydroxybenzene, 2,4-diamino-1-(β-hydroxyethyloxy)benzene, 2-amino-4-(β-hydroxyethylamino)-1-methoxybenzene, 1,3-diaminobenzene, 1,3-bis(2,4-diaminophenoxy)propane, sesamol, α-naphthol, 6-hydroxyindole, 4-hydroxyindole, 4-hydroxy-N-methylindole, 6-hydroxyindoline, 2,6-dihydroxy-4-methylpyridine, 1-H-3-methylpyrazol-5-one and 1-phenyl-3-methylpyrazol-5-one, and the addition salts thereof with an acid. When they are present, these couplers preferably represent from 0.0001 to 10% by weight approximately relative to the total weight of the composition (A) and even more preferably from 0.005 to 5% by weight approximately. In general, the addition salts with an acid of the oxidation bases and couplers are chosen in particular from the hydrochlorides, hydrobromides, sulphates, tartrates, lactates and acetates. The composition (A) may also contain, in addition to the oxidation dye precursors defined above and the optional associated couplers, direct dyes in order to enrich the shades with glints. These direct dyes may be chosen in particular from nitro dyes, azo dyes or anthraquinone dyes. and the molecular weight of which, determined by gel permeation chromatography, is about 1200. The composition (A) may also contain an effective amount of other agents, which are moreover previously known in oxidation dyeing, such as various common adjuvants, for instance sequestering agents, hair conditioners, silicones, preserving agents, opacifiers, etc., and optionally anionic, cationic, nonionic, amphoteric or zwitterionic surfactants or mixtures thereof. The said composition may also contain antioxidants. These may be chosen in particular from sodium sulphite, thioglycolic acid, thiolactic acid, sodium bisulphite, dehydroasorbic acid, hydroquinone, 2-methylhydroquinone, tert-butylhydroquinone and homogentisic acid, and they are then generally present in amounts ranging approximately from 0.05 to 1.5% by weight relative to the total weight of the composition. Obviously, a person skilled in the art will take care to select the optional complementary compound or compounds mentioned above such that the advantageous properties intrinsically associated with the dye composition according to the invention are not, or are not substantially, adversely affected by the addition or additions envisaged. In the composition (B), the oxidizing agent is preferably chosen from urea peroxide, alkali metal bromates or ferricyanides, and persalts such as perborates and persulphates. The use of hydrogen peroxide is particularly preferred. The composition (B) advantageously consists of an aqueous hydrogen peroxide solution whose titre may range, more particularly, approximately from 2.5 to 40 volumes and, even more preferably, approximately from 5 to 20 volumes. The pH of the ready-to-use composition applied to the keratin fibres (composition resulting from mixing together the dye composition (A) and the oxidizing composition (B)) is generally between the values 4 and 11. It is preferably between 6 and 10, and may be adjusted to the desired value by means of acidifying or basifying agents that are well known in the state of the art in the dyeing of keratin fibres. 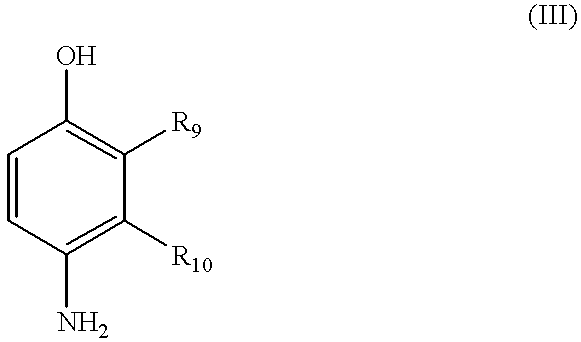 in which R is a propylene residue optionally substituted with a hydroxyl group or a C1-C4 alkyl radical; R13, R14, R15 and R16 which may be identical or different, represent a hydrogen atom or a C1-C4 alkyl or C1-C4 hydroxyalkyl radical. The acidifying agents are conventionally, by way of example, inorganic or organic acids such as hydrochloric acid, orthophosphoric acid, carboxylic acids such as tartaric acid, citric acid or lactic acid, or sulphonic acids. The dyeing process according to the invention preferably consists in applying a mixture, which is prepared as required at the time of use from the compositions (A) and (B) described above, onto the dry or wet keratin fibres and in leaving the mixture to act for an exposure period preferably ranging from 1 to 60 minutes approximately, and more preferably from 10 to 45 minutes approximately, in rinsing the fibres, then in optionally washing them with shampoo and then rinsing them again and drying them. At the time of use, this composition was mixed weight for weight with a 20-volumes aqueous hydrogen peroxide solution and the mixture obtained was then applied to locks of permanent-waved hair containing 90% white hairs. After leaving to stand on the locks for 30 minutes, they were rinsed and then washed with a shampoo, rinsed again and then dried. Using an I.C.S. spectrocolorimeter, the value L* in the L*, a*, b* international colour notation system from C.I.E. was measured. 16 grams of decyl alcohol (C10-C12-C14/85-8.5-6.5) oxyethylenated with 5.5 mol of ethylene oxide, sold under the name Mergital BL 589 by the company Henkel. Conclusion: the shade obtained according to the invention is more intense (lower L*) than that obtained according to the prior art. at least one nonionic amphiphilic polyether urethane polymer comprising at least one fatty chain; and at least one ingredient chosen from cationic, anionic, nonionic, amphoteric, and zwitterionic surfactant. 3. A composition according to claim 2, wherein said at least one nonionic amphiphilic polyether urethane polymer is chosen from PPG-14 laureth-60 alkyl dicarbamate and PPG-14 palmeth-60 alkyl dicarbamate. 4. A composition according to claim 1, wherein said at least one nonionic amphiphilic polyether urethane polymer is chosen from PPG-14 laureth-60 alkyl dicarbamate and PPG-14 palmeth-60 alkyl dicarbamate. at least one nonionic amphiphilic polyether urethane polymer comprising at least one fatty chain; and at least one ingredient chosen from cationic and amphoteric substantive polymers. 7. A composition according to claim 6, wherein said at least one nonionic amlphiphilic polyether urethane polymer is chosen from PPG-14 laureth-60 alkyl dicarbamate and PPG-14 palmeth-60 alkyl dicarbamate. 8. A composition according to claim 5, wherein said at least one nonionic amphiphilic polyether urethane polymer is chosen from PPG-14 laureth-60 alkyl dicarbamate and PPG-14 palmeth-60 alkyl dicarbamate. 11. A composition according to claim 10, wherein said at least one nonionic amphiphilic polyether urethane polymer is chosen from PPG-14 laureth-60 alkyl dicarbamate and PPG-14 palmeth-60 alkyl dicarbamate. 12. A composition according to claim 9, wherein said at least one nonionic amphiphilic polyether urethane polymer is chosen from PPG-14 laureth-60 alkyl dicarbamate and PPG-14 palmeth-60 alkyl dicarbamate. 15. A composition according to claim 14, wherein said at least one nonionic amphiphilic polyether urethane polymer is chosen from PPG-14 laureth-60 alkyl dicarbamate and PPG-14 palmeth-60 alkyl dicarbamate. 16. A composition according to claim 13, wherein said at least one nonionic amphiphilic polyether urethane polymer is chosen from PPG-14 laureth-60 alkyl dicarbamate and PPG-14 palmeth-60 alkyl dicarbamate. at least one hair conditioning agent. 19. A composition according to claim 18, wherein said at least one nonionic amphiphilic polyether urethane polymer is chosen from PPG-14 laureth-60 alkyl dicarbamate and PPG-14 palmeth-60 alkyl dicarbamate. 20. A composition according to claim 17, wherein said at least one nonionic amphiphilic polyether urethane polymer is chosen from PPG-14 laureth-60 alkyl dicarbamate and PPG-14 palmeth-60 alkyl dicarbamate. combining the composition for the oxidation dyeing of keratin fibres and the oxidizing composition to form the hair dye composition, said at least one oxidation dye precursor being present in an amount effective for developing color on hair. wherein said at least one oxidation dye precursor is present in an amount effective for developing color on hair. 23. A ready-to-use composition for oxidation dyeing of keratin fibres comprising at least one oxidation dye precursor; at least one nonionic amphiphilic polyether urethane polymer comprising at least one fatty chain; an oxidizing agent; and at least one surfactant chosen from anionic, cationic, nonionic, amphoteric, and zwitterionic surfactant. applying at least one oxidizing agent to said fibres under conditions sufficient to develop color. applying an oxidizing composition comprising at least one oxidizing agent to said fibres in alkaline, neutral or acidic medium to develop color. applying the at least one oxidation dye precursor, the at least one surfactant, the at least one nonionic amphiphilic polyether urethane polymer, and the at least one oxidizing agent sequentially to said fibres without intermediate rinsing to develop color. FR2679444A1 (en) 1991-07-25 1993-01-29 Oreal Use as thickening agents for oils, in an oily cosmetic composition, of a combination of two copolymers. CH649211A5 (en) * 1980-06-06 1985-05-15 Oreal Compositions containing bis-quaternary ammonium derivatives for the treatment of keratin materials and natural textile materials, synthetic or non-keratin. DE69206609T2 (en) * 1991-03-19 1996-08-08 Procter & Gamble Cosmetic compositions containing hydrophobically modified polymers and unsaturated quaternary ammonium surfactants. FR2680684B1 (en) * 1991-08-29 1993-11-12 Oreal Cosmetic screening composition comprising a metal oxide nanopigment and a filter polymer. Acrysol 44 Cosmetic Grade, Rheology Modifer and Stabilizer, 1995, 7 pages, no month available. Acrysol 44/Acrysol 46-Thickeners and Stabilizers for Personal Care, Charles E. Jones Ph.D., 1 page, no date available. Acrysol 44/Acrysol 46—Thickeners and Stabilizers for Personal Care, Charles E. Jones Ph.D., 1 page, no date available. Acrysol 44-Cosmetic Grade Rheology Modifier and Stabilizer, Product Information, 7 pages, Sep. 1994. Acrysol 44—Cosmetic Grade Rheology Modifier and Stabilizer, Product Information, 7 pages, Sep. 1994. Aculyn personal care polymers-Aculyn 44 cosmetic grade rheology modifier and stabilizer, 8 pages, Jul. 1994. Aculyn personal care polymers—Aculyn 44 cosmetic grade rheology modifier and stabilizer, 8 pages, Jul. 1994. Aculyn personal care polymers-Aculyn 44 cosmetic grade, rheology modifier and stabilizer, Jun. 1996, 6 pages. Aculyn personal care polymers—Aculyn 44 cosmetic grade, rheology modifier and stabilizer, Jun. 1996, 6 pages. Aculyn personal care polymers-Aculyn 44 Stabilizer/ Thickener for personal care applications, 9 pages including 5 pages of proposed formulations, Mar. 1994. Aculyn personal care polymers—Aculyn 44 Stabilizer/ Thickener for personal care applications, 9 pages including 5 pages of proposed formulations, Mar. 1994. Aculyn personal care polymers-Aculyn 46 cosmetic grade rheology modifier and stabilizer, 7 pages, May 1997. Aculyn personal care polymers—Aculyn 46 cosmetic grade rheology modifier and stabilizer, 7 pages, May 1997. Aculyn personal care polymers-Aculyn 46 cosmetic grade rheology modifier and stabilizer, 8 pages, Aug. 1997. Aculyn personal care polymers—Aculyn 46 cosmetic grade rheology modifier and stabilizer, 8 pages, Aug. 1997. Aculyn personal care polymers-Aculyn 46 Two-part Oxidative Hair Dye, 2 pages, Apr. 1997. Aculyn personal care polymers—Aculyn 46 Two-part Oxidative Hair Dye, 2 pages, Apr. 1997. Aculyn personal care polymers-Aculyn Thickeners and Stabilizers for Personal Care, (Aculyn 22, 33 and 44) Jul. 1994, 7 pages. Aculyn personal care polymers—Aculyn Thickeners and Stabilizers for Personal Care, (Aculyn 22, 33 and 44) Jul. 1994, 7 pages. Aculyn personal care polymers-Aculyn thickeners and stabilizers for personal care, (Aculyn 22, 33 and 44) May 1996, 7 pages. Aculyn personal care polymers—Aculyn thickeners and stabilizers for personal care, (Aculyn 22, 33 and 44) May 1996, 7 pages. Aculyn personal care polymers-Cationic Cream Lotion Formulation, 2 pages, Mar. 1994. Aculyn personal care polymers—Cationic Cream Lotion Formulation, 2 pages, Mar. 1994. Aculyn personal care polymers-Rheology Modifiers for Personal Care Applications, Liquid Thickener/Stabilizers, Mar. 1994, 2 pages. Aculyn personal care polymers—Rheology Modifiers for Personal Care Applications, Liquid Thickener/Stabilizers, Mar. 1994, 2 pages. Aculyn personal care polymers-thickener applications (Aculyn 22, Aculyn 33, and Aculyn 44), 2 pages, Jul. 1994. Aculyn personal care polymers—thickener applications (Aculyn 22, Aculyn 33, and Aculyn 44), 2 pages, Jul. 1994. Aculyn personal care polymers-Thickener Applications, (Aculyn 22 33 and 44) Mar. 1994, 2 pages. Aculyn personal care polymers—Thickener Applications, (Aculyn 22 33 and 44) Mar. 1994, 2 pages. Aculyn personal care polymers-Thickeners and Stabilizers for Personal Care, (Aculyn 22, 33 and 44) May 1995, 8 pages. Aculyn personal care polymers—Thickeners and Stabilizers for Personal Care, (Aculyn 22, 33 and 44) May 1995, 8 pages. Aculyn(R) 44 Thickener/Stabilizer Information (6 pages) 1992. Aculyn® 44 Thickener/Stabilizer Information (6 pages) 1992. CTFA International Cosmetic Ingredient Dictionary, 4th Edition, 1991, pp. 462-464, 656, 661. CTFA, International Cosmetic Ingredient Dictionary, 5th edition, 1993, vol. 1, pp. 98-99, 174-175, 370-371, 432, and 764, plus two pages from on-line. Dr. Charles E. Jones, A Systemic Study of the Effect of Nonionic Hydrophobically-modified Ethoxylated Urethane Rheology Modifiers on Cationic Surfactants, Societá, Italiana di Chimica e Scienze Cosmetologiche, Nov. 25, 1993, pp. 29-44. Dr. Yves Duccini, Pollena TSPK, Sympozjum Rohm & Haas, Warszawa, 10/93, 37, 10, 13 pages. Dr. Yves Duccini, Pollena TSPK, Sympozjum Rohm & Haas, Warszawa, 10/93, 37, 10, 13 pages. [Translation]. English Language Abstract of EP 0 673 641, Sep. 1995. Formulation Chemicals, Developmental Rheology Modifier SA-229N, 1993, 4 pages, no month available. Formulation Chemicals-Acrysol 46 cosmetic grade rheology modifier and stabilizer, 7 pages, Apr. 1997. Formulation Chemicals—Acrysol 46 cosmetic grade rheology modifier and stabilizer, 7 pages, Apr. 1997. Ingredients for Personal Care, Product Information, Thickeners and Rheology Modifiers Elfacos(R) T 211 and Elfascos(R) T 212 (3 pages) (no date available). Ingredients for Personal Care, Product Information, Thickeners and Rheology Modifiers Elfacos® T 211 and Elfascos® T 212 (3 pages) (no date available). Letter from D. Boutet to Mmd. Morin re: Elfacos, letter-1 page (with translation), attachments-3 pages (Ingredients for personal care-product information Elfacos T211 and T212, Feb. 12, 1998. Letter from D. Boutet to Mmd. Morin re: Elfacos, letter-1 page (with translation), attachments-3 pages (Ingredients for personal care—product information Elfacos T211 and T212, Feb. 12, 1998. Letter from G. Deyber to Mme. Magnet re: Aculyn 46, 2 pages, Oct. 27, 1998. May 27 (27 mai) 1994 letter from D. Boutet of Akzo Nobel to M. Maes of L'Oréal (with translation). May 27 (27 mai) 1994 letter from D. Boutet of Akzo Nobel to M. Maes of L'Oréal. R&H Provisional Application 60/045,390 filed May 2, 1997. U.S. patent Application Ser. No. 09/008,209 filed Jan. 16, 1998, which is the priority application of published PCT application WO 99/36047 filed Dec. 9, 1998.